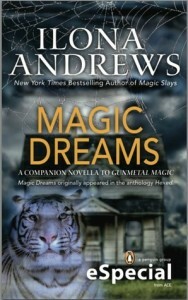 Magic Dreams originally appeared in the anthology Hexed. From New York Times bestselling author Ilona Andrews comes a tale of darkness, desire, and werecats. Alpha Pack leader Jim Shrapshire has always been the strong, silent type. But something has come over him–a magic force currently residing in one of the Pack’s headquarters. Were-tigress Dali Harimau has always wished she could get Jim’s attention–but now he needs her help. Stricken with a magic-sickness, Jim needs Dali’s flair for magic. And to save him, she must challenge a powerful, dark being to a battle of wits. Do you have a book or series that, when you are feeling blah, you can pick up and it will instantly make you feel better? For me, it’s the Kate Daniels series by Ilona Andrews. It doesn’t have to be a Kate book per say, it can be a novella written in the same world…like this one. I was in a bit of a funk after a particularly tough day and picked this up and read it in one sitting. Man oh man can this author write! Their stories are just so interesting and their characters…you just can’t beat them. But before I continue blabbing and barely making any sense, let’s start at the beginning. Of the book that is. Magic Dreams is a story that originally appeared in the Hexed anthology in 2011 but Penguin is now selling the eBook version on its own. It features Jim, the cat clan’s Alpha and Curran’s head of security, and Dali, a mostly blind white tiger shifter who is just so gosh darned likable you want to pinch her little cheeks. As soon as you meet her in the Kate full length books you can’t not like her! I’m doing it again. I’m getting off track. I really have to stop doing that. We meet Jim in Magic Bites, the book that starts it all. He is surly and rough and you like him yet you are almost cautious of him. Soon you learn that he is strong and extremely loyal and so so smart. In Magic Dreams, he gets cursed by magic sleep while going to check on some clan members who are not where they should be and since he knows it’s magic, he goes to Dali for help since she is sort-of-kind-of magically inclined. Dali wants Jim but she’s convinced he doesn’t notice her ‘in that way’. You can tell that Jim likes Dali but how deep it runs you are left wondering. We meet Dali’s mom in this book and her first scene is hilarious! There is so much humor in this book but of course, since Jim is dying in it, it also has the usual urban fantasy weight too. For me, that combo is perfection. The last scene in the book I must tell you I read it three times in a row. Then I read it again first thing the next morning. It was just so…perfect! It made the cockles of my heart swell and tingle. I also smiled like an idiot every time. Every. Time. Overall, Kate fans will not want to miss this novella. And if you have yet to read a Kate Daniels book but are curious about the world, you can read Magic Dreams with no problem. 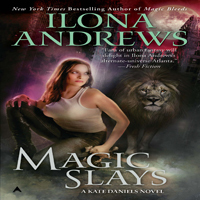 Share the post "Review: Magic Dreams by Ilona Andrews (Kate Daniels #4.5)"
OOOh awesome! I really can’t wait to read this one now, I would love to learn more about Jim. Hmm but I think I may be have Hexed. Thank you for the review! I wanted this but didn’t want to buy the entire Hex anothology for it. Thanks for having this amazing blog.I really appreciate your reviews. Great review–thanks!!! I love Ilona Andrews and I LOVE LOVE LOVE this series!! I have been wanting to read about Dali and Jim for a while. I totally understand about this series picking you up from a slump–I feel the same way and I love rereading Kate and Curran from their beginning!!! Have a great weekend!! DonnyRedNr1 / Oh man this is amazing, I cannot wait to see the Town Hall Organ. In the future there are gonna be whole orchestras playingï»¿ music with their boi3&se#82d0; The body as an instrument, really excited about the developement of this. Also, is there a way to implement eye-movements in the future? great stuff chris!